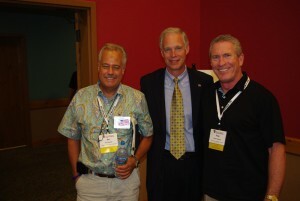 While attending the AGC of Wisconsin Summer Meeting this past July, Peter Scherrer had the opportunity to meet Ron Johnson, candidate for the U.S. Senate, and hear Ron's vision and goals. An Oshkosh based manufacturer, Ron's focus include job creation and fiscal restraint. The annual AGC event was held at the Wilderness Resort in Wisconsin Dells. Great activity on Hwy 36 in Burlington! 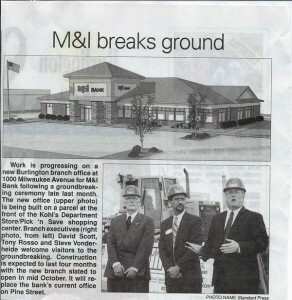 M&I bank has begun construction on their new branch office. The site for the new building is an outlot that was sold to M&I by The Peter Scherrer Group last fall. It is located in front of the new Kohl's Department Store and Pick 'n Save. The parcel adjacent to the new M&I Bank is owned by the Peter Scherrer Group and once preleasing is completed, a 20,000 sf retail building will be built.